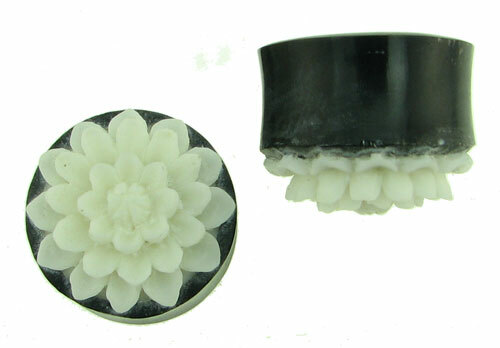 These horn double flared plugs are inlaid with lotus blossoms that are carved from water buffalo bone. 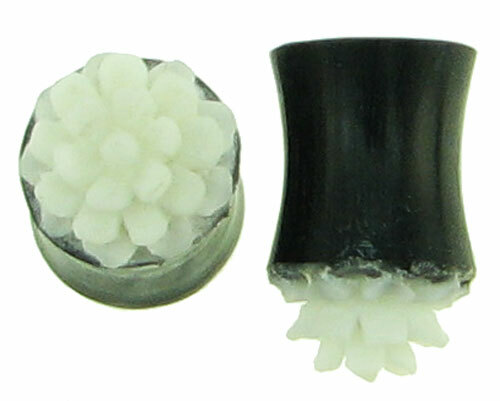 They are the perfect choice to fill your large piercings. They are unique, eye catching, and comfortable. These Water Buffalo Horn Saddles were hand carved in Indonesia. Rather than mass-manufactured, these Saddles are made by hand, so some variation (such as color, texture, size, etc.) is present from piece to piece in a pair and also from the pair shown in this photo. Actual size of Saddles may vary up to approx. 1/2 size from size listed. For example, if you select a 0 gauge pair of Saddles, the actual size may be smaller than 0 gauge but bigger than 1gauge. Or, if you select a 1 inch, the actual size may be bigger than 1 inch but smaller than 1-1/16 inch. Approximate Length of 0 gauge size: 0.59 inch. Approximate Length of 1 inch size: 0.89 inch. Other gauge or fractional inch sizes may be available, Contact Us for more information. 3/4 inch (+$16.00) 15/16 inch Select your size and click "Add to Cart".